A while back, I spotted baked goat cheese on a menu and it’s been stuck in my head, begging to be made, ever since. Now that we’re in full swing chilly, dreary (ugh, this rain though!) fall days here, bring on the all the warm, cheesy goodness! I’m a big fan of goat cheese, love the creaminess and tangy flavor! Mike on the hand, is not a fan. He once described the flavor as licking a goat. 😂 (My question is, how does he even know what a goat would taste like?!). 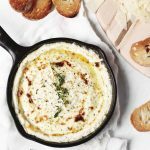 But for those of that haven’t been out licking goats and can’t get enough goat cheese – this dip is perfect creamy deliciousness! Even Mike said it wasn’t too bad – ha! I think the addition of cream cheese (what doesn’t cream cheese make better?!) and parmesan, along with fresh herbs and garlic, bring out the best flavors. You can use whatever herbs you have on hand and mix & match to your liking. This dip is perfect for all those fall gatherings coming up (hey Thanksgiving – you’re almost here!). A creamy, cheesy warm dip with a hint of garlic and herbs. In a food processor, combine goat cheese, cream cheese, parmesan, and garlic. (You can also add in about half the herbs now too if desired). Process until smooth. Spread cheese mixture into baking dish. Bake 15-20 minutes until golden and bubbly. (You can also stick it under the broiler for a minute or so to enhance the browning on top). Drizzle on olive oil and top with fresh herbs and pepper. Serve immediately with toasted baguette or crackers. So tell me, are you a fan of goat cheese or are you with Mike thinking it tastes like licking a goat – haa! !